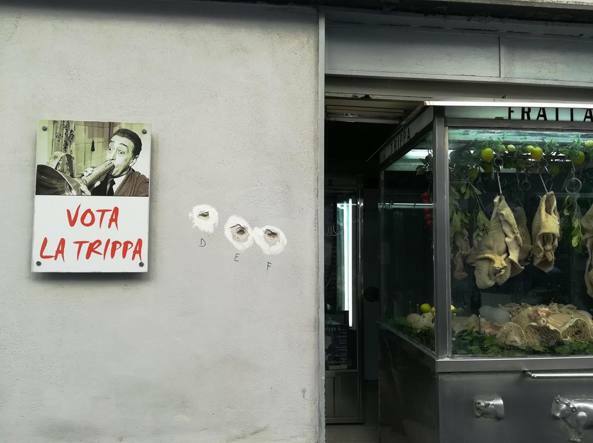 While I was in Rione Sanità a few days ago, I took this photo, which was on a wall beside a shop that sold offal, including tripe (trippa). The fellow pictured is Totò, a famous actor and poet who was born in this district of Naples. I didn’t think I’d be using the image, it just took my fancy. Then, when I was reading some stuff online about this area, I came across this article (translated by Google) and photo from a newspaper, dated only a couple of years ago. The marks in the wall show where the gun slugs were embedded. I made a point of going back to see if they were still visible, but the wall has been re-plastered. The same day that I had taken the photo of Totò, I saw this little statue, and went over for a closer look. It turned out to be another fairly recent reminder that there is a dark side to life in some parts of Italy. On 15 September 2015, 17 year old Genny Cesarano was in the wrong place at the wrong time, and was killed by a stray bullet in cross fire between 2 rival gangs vying for territorial control, the “stretch” mentioned in the newspaper article. Four men were found guilty of his murder and all received life imprisonment sentences. I haven’t been back to this district again. The capital city of the state where I live seems to have a homicide every day, often drug related. What a beautiful and poignant statue of that boy. What do the letters say. It doesn’t look as though there are enough to say ‘assassinato’. It’s dedicated to all the young people of Naples, the hope for the future. You’re right, no mention of assassination, just ” victim of absurd violence”. It ends with Genny now plays with the angels. Is there something in the heading that suggests, “In playing, play against . . . (inferring La Camorra?) Not sure if that is high Italian or part of the Napolitano dialect. I am not conversant enough. That could well be, Gabby One. Sad stories today, Yvonne and an unpleasant reminder of reality. It certainly brought me down to earth, et. This is sad. Those bullet holes with letters next to them! I guess a lot of people around the globe live with this sort of possibility, eh? Well that’s Italy for you. When in Sicily a few years back there was evidence of the Mafia at work. So distressing that this violence continues. And, it’s still seething away here in Naples. The residents and shop owners in another area I like going to, for fresh produce and a very excellent trattoria, just had a meeting to demonstrate solidarity against organised crime last week. Wow! Sounds like a Hollywood movie. Unfortunately, I think innocents dying is a global phenomenon, Julie. But, we can’t all stop going about our daily lives. And, I went back to the district today, and talked a couple of volunteers who have been involved in trying to help Sanita regain its pride and stability. They were enthusiastic, intelligent young people. Yes, it’s such a shame when things like this put you off an area, a town or a city. One must be very careful in Naples, and Palermo (my favourite city) but having said that, even being careful you can still fall foul of the ‘stray bullet’ or taking a wrong turning into a disreputable area. That’s absolutely so, Mari. There is a lot of poverty in this city, but the spirit of the people is so alive. I have had help from so many of them, they were all just nice human beings. I hope I can be like them, if the need arises. My area is fairly peaceful also but go a few blocks in the wrong direction and we have gangs also and poor children getting caught in the crossfire…or in the most recent case a woman in her sixties sleeping in her bedroom. Yes, Yvonne you live in a very quiet area but then if you watch Dr. Blake you know that even the quietest, sleepiest towns (I guess Balarat has changed since the 50’s) has it’s crime. I think those articles would keep me away from that area too. You might want to join our friends on their island. I think even my little town could show me a few things I didn’t expect, Michelle. Probably. It seems just going around a corner gives you something you didn’t expect. Sometimes it’s even a good thing. South Italia is a poor area and Mafia makes law . This a sad stoy that you relate but this is the reality . That is a very sad story. I hope that Genny is indeed playing with the Angels. Oh wow! I live in such a peaceful little town.